Microsoft Connect (https://connect.microsoft.com/) is the website where users can report bugs or suggestions related to Microsoft products, including Dynamics CRM. 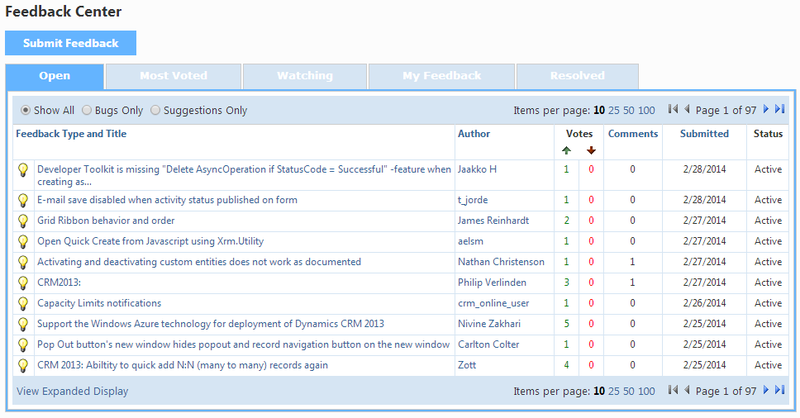 Users can upvote (or downvote) the entries, in this way Dynamics CRM product team can prioritize the requests. I got this message because I wasn't currently logged in with my Microsoft Account linked to Connect website. New users can be misguided by the "Page Not Found" written in red, but the truth behind is a permission issue: you need to join first the program in order to see the entries. And now it is possible to open the Connect links (related to Dynamics CRM) and start to upvote. You can also submit a new entry, but search if a similar request is already created by someone else, a single request with 30 upvotes it's more useful than 3 similar requests with 10 votes each.